Magic Bags are the other tools for a special practice, for almost all various purposes. Wish-making & wish-granting bag, Transmute bag, Cleanse object bag, Spell stone pouch, Conjure kinetic energy bag and many other pouches and bags are represented here. They can help in a great number of different rituals. For example, a Pairing bag makes the closest channel between you and the spirit or spell. The Whispering bag intensifies the manifestation of spirits and entities. The Recipe bag helps to create your own spell blends and custom-blend of enchantments. And the Ultra complex bag combines the powers of the Transmute bag, Recapture bag, Capture stone, binding and charging of any spirited or spelled vessels. With the help of our Bindings bags, you can make a super awareness of everything that exists in a normal and paranormal state around you. You can get a necessary support to come to a right decision or fill your amulets with special energies and powers. All these bags can be purchased here at a low price. They are pretty-looking and hardly prompt the questions in the others. Besides, the special boxes to summon different beings, to attract spirits and for other purposes are also can be found in this section, as well as the other objects. Make your choice and shop. This bag is for cleansing objects that you feel have negative or low vibrations. This bag can be used in conjunction with the Attach Magic bag as you can cleanse the object in question and transfer the spell attached to it to another object before it becomes corrupted again. But... without the Attach Magic bag you can use this Cleanse Object bag to erase any bad or negative energies you feel are within your object. When you place a personal artifact of yours into the bag you will be surrounded by a field of clearing energy which will remove all the negativity, voids and malicious energy which has taken root within you. You will find it masterfully surrounds and engages you in ways you never knew possible before. It uproots and clears all the ugliness that resides within you and gives you a tremendous empowerment of strength & light that matters greatly for your ongoing chances of success. A fantastic new Binding Bag which allows you to clone your energy in whole or part from your 3 bodies and rebind it to yourself for greater power, support in a specific area, or helping you to bond & work with specific spirits, entities or magick. This conjuration bag will conjure all necessary Kinetic energy needed towards any effort. This is great if you are working on developing Kinetic abilities because it can conjure and bind around you the energies related directly to any Kinetic path. It is also great when you are working with any spirit, entity or spell to conjure Kinetic energy that is related to your companion or activity. This can open many new opportunities and doors for you when it comes to understanding, bonding and experiences! The bag will create an amulet that is infused with the Kinetic energy of your choice which you can use as often as needed within 30 days. You can fuse multiple different types of Kinetic energy to an amulet at a time and you can re-fuse them as often as needed. Baba Yagas are extremely gifted practitioners of magick who leave an untamed mark on the Earth. They are the seat of wisdom and methodology that is quite unlike anything you have seen in the world in the 20th or 21st century. They are heavily motivated and invested in the Earth's core energy and core paths of magick and therefore are among some of the most powerful beings known when it comes to potion-making, spellcasting, protective measures, and casting any spell or ritual. This conjuration bag will create points related to your future. You will bind each creationary point with a milestone you wish for your life and you will place each future point around your home. Conjuring Stone for Spirits, Entity, Magick & Energy for What You Need Now! You will receive a Conjuring Stone which can temporarily pull through any energy, magick, spirit, or entity that is necessary to help you in your life at present! Or, to help you fulfill a desire or wish! This is a fantastic way for you to have what you need or want. Our brand new Destiny Designer allows you to guide your Destiny towards the type of life you wish for yourself. You can make subtle changes or encourage larger changes to make a difference for your life. You can use the Destiny Designer bag to make changes for your immediate or future paths. The more integrated and connected you are with your Destiny the stronger and more powerful you become as your Destiny is inter-woven into everything about yourself and your life. You can use the bag for loved ones who live with you (not recommended for those outside of the home) to help influence their Destiny and shape their futures. The bag can be used as often as needed to influence the paths you take, the relationships you make, and the future you want to have. Dream Bag :: Make Your Dreams Fill Your Destiny! Dream Bags are very powerful tools in helping your dreams to evolve and become more powerful insights into your life. Before you go to sleep write on a piece of paper your desires, concerns, fantasies, and place the bag under your pillow. Your dreams will bear directly based upon what you’ve placed in the bag. They can be informative dreams that will help you with a situation, they can be fun dreams that live up to your fantasies & desires, or they can be powerful dreams that will help you to shape the course of your Destiny and future. This creative bag binds the energy of anything you wish and the energy will last up to 3 days. You need to be specific when using this bag as it will bind the exact energy you ask for. If you are too generic the energy will not be powerful or targeted. You can use this to capture the energy of any person, entity, creature, animal or location. It's great because you can temporarily assume the energy of anything you wish. 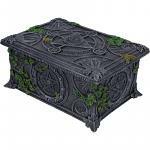 You will receive a beautiful Faery box enchanted with a powerful spell which attracts Fae spirits (of all kinds) to your home. We have also included a spell that attracts rarer Fae! The instructions for use are simple and come with the box. You can choose to attract White Arts or Dark Arts Fae. They will not be bound, but they can stay as long as they want or you want. You will receive a Binding Bag that will bind the spell-blend of your choice to any vessel you desire! You can bind the spell-blend to any empty, spirited, or spelled vessel. The herbs can be used around the home to boost the effectiveness of any spellbinding you have. An amulet which will provide a protective field so you can interact and engage your magick in complete privacy. Our brand new Mental Magick Conjuring Bag allows you to conjure an idea or thought and then send that idea or thought to someone else as if it were their own. This is a great way to connect or bond with someone, to help persuade or influence a situation, inspire someone with positive thoughts, help soothe someone's mind or guide them in a new path, or give that special someone a hint of what you want... the possibilities are endless! Place any object in the bag to have it imbued with a mystical charge that invites empowering & enlightening thoughts, dreams and visions that can send you onto a new path that you never thought of before. The mystic energy used to create these bags embody the essence of power and self-intuition. Each amulet you create with the bag is imbued with the energy for up to 30 days. Every time you use the bag the type of mystic energy will be unique to what is going on in your life right now. To imbue any object, place it inside the bag, or place the bag on the object, and recite "Mystica marai morzino carir" (Miss-tee-kah mah-ray mor-zee-no kah-reer). This binding is a fun and gives you the ability to overlay energies from one target to another. It is temporary and it completely overlays energies. For example, if you wanted to overlay the energies of a bear onto a leather bracelet you wanted to wear for the day it would do that. Every year we try to come out with a new para-technology that will aid Spirit Keepers, and practitioners of Magick with new tools that really make a difference in their journey. Over the last 9 years we've brought you Bridging, Transmute Bags, Recapture, Reclaim, Triumvirate, Power Orbs, & more. We've developed something brand new, Pairing. It's a means through which you can pair yourself to a spirit, or a spell, and the bond will be closer than anything you've ever experienced before!